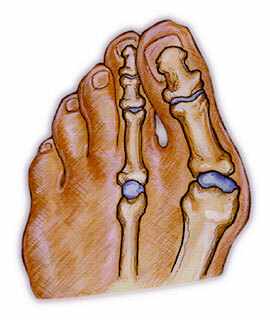 A bunion is a medial deviation and inflammation of the metatarsophalangeal (MTP) joint of the big toe. The capsule of the joint is subluxed (displaced), thickened and enlarged, and the cartilage of the joint is damaged. There are three degrees of bunions: mild, moderate and severe. Bunions are not hereditary, although the tendency to over-pronate, which is the cause of bunions, has a hereditary component. Since the problem is the over-pronation, bunion treatment would include the patient being fitted with orthotics; one can expect a slow recovery over a period of months. Orthotics will not cause the physical deformity to regress, but will simply arrest any further progression and likely stop the pain. 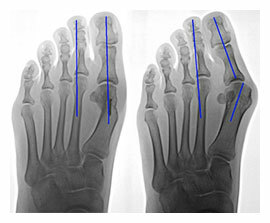 It is important to note however, that when bunions are severe and require surgery, the bunion can be corrected, but will develop again unless the root cause of over-pronation is corrected. Since overpronation is the root cause, orthotics are still necessary.